I went straight down as low as I could actually wading along a rockcliff inspecting it. I was very slow as there was so much new stuff to find. 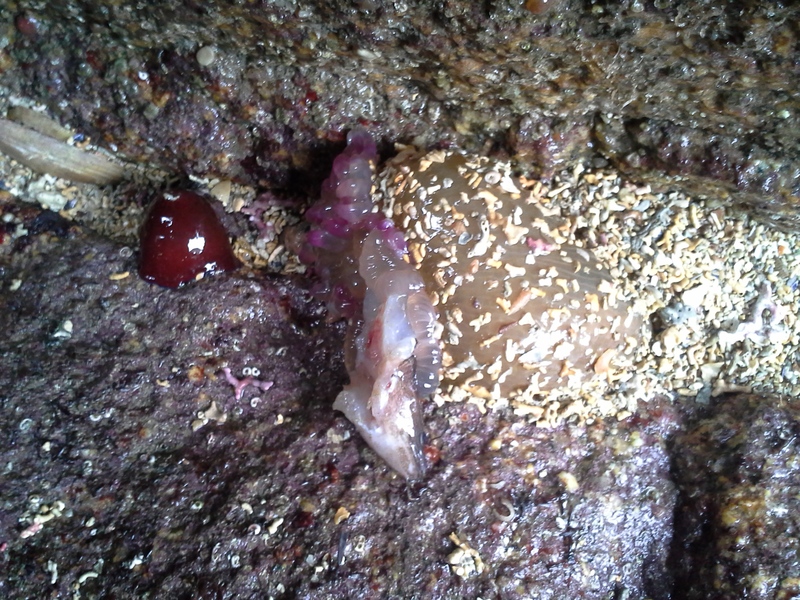 Actually most of the findings below where only within about 10 meters of rockledge right at the lowtide mark! First off was something that I had never expected. 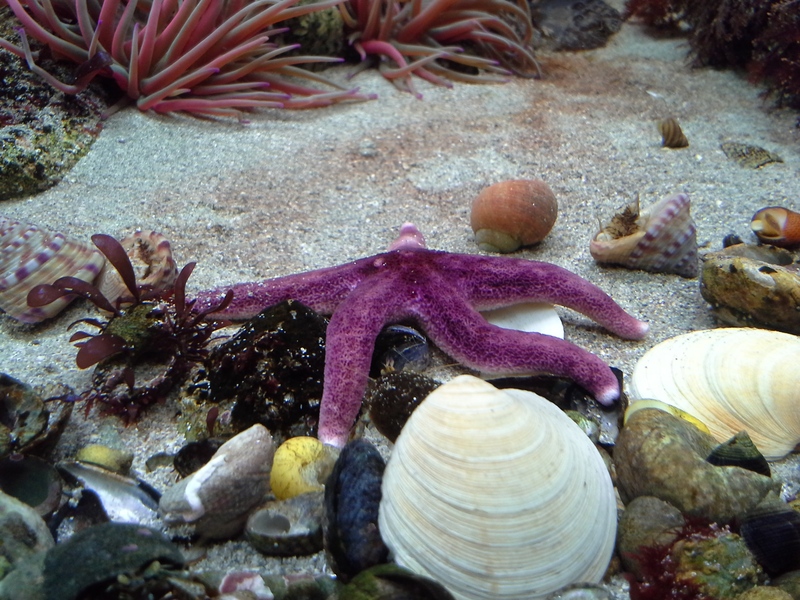 A purple Seastar (possibly Henricia oculata ) that was actually just sitting ontop of a rock. Usually in the higher pools everything interesting is under the rocks where as here all was exposed as if the animals where not expecting the water to get that low. 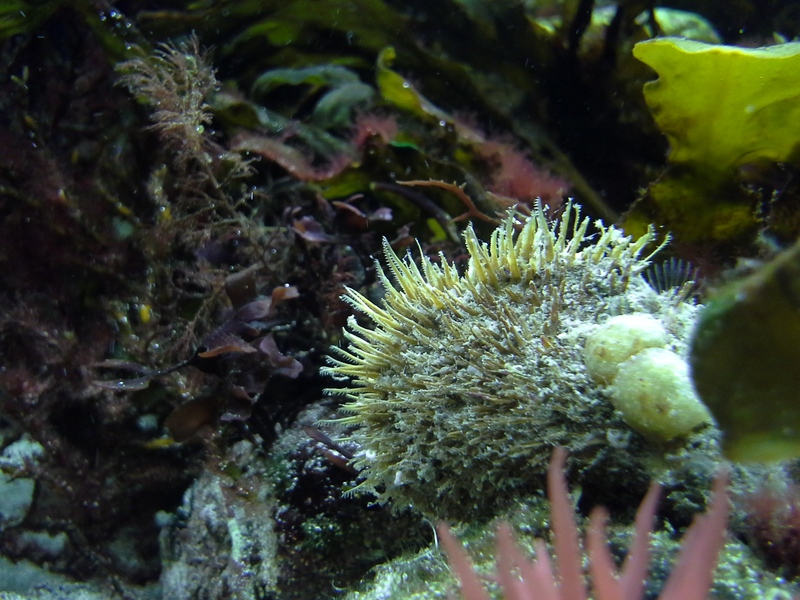 I found a scorpionfish that was just sitting in the dry as well as two what I think are 5 bearded Rocklings. 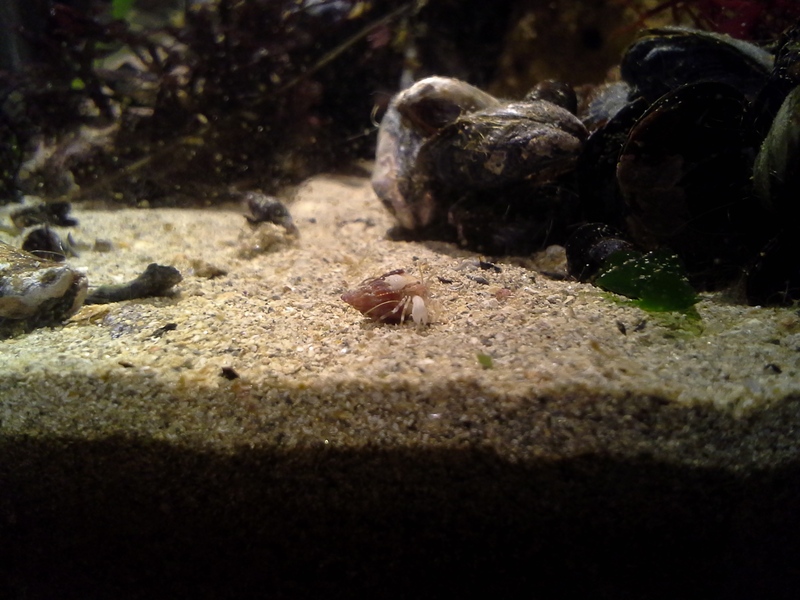 Next up was a tiny intriguing 9mm hermit crab with and unusually bright white paddle shaped claws and micro patterns on the legs. Beautiful but couldnt identify it yet and very hard to take pictures as its in the “Nonpredator/Observation” 30l plastic tank. A beautifully covered Mussel was also very interesting. 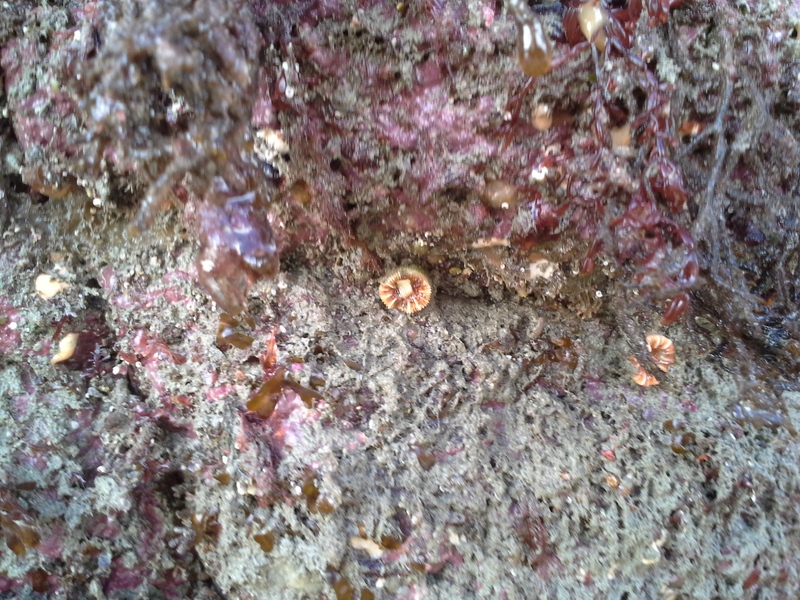 There are some big barnacles on it and what I believe to be a sponge and lots of hydroids that I havent been able to identify. Anybody any ideas? Some massive fist-size Dhalias, one of them has probably bitten off a bit more than it could chew. 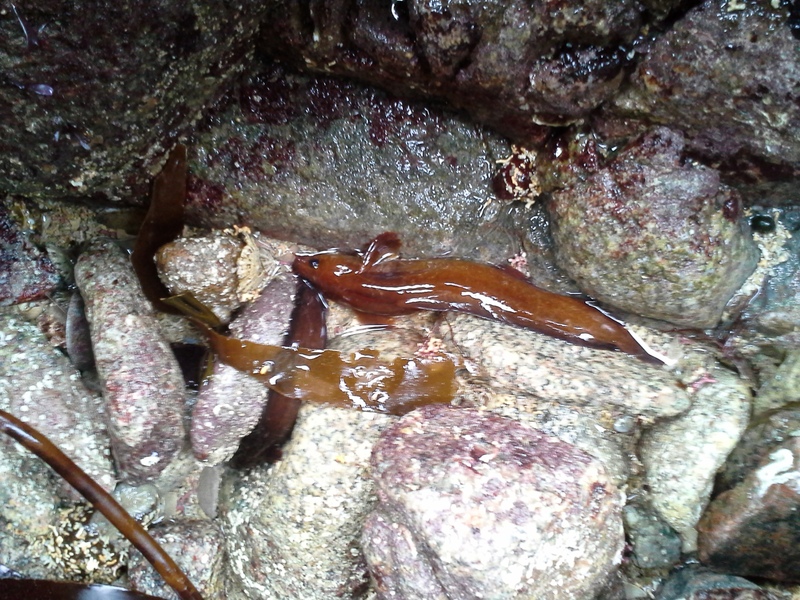 I think its dinner was a baby conger eel or a rockling. 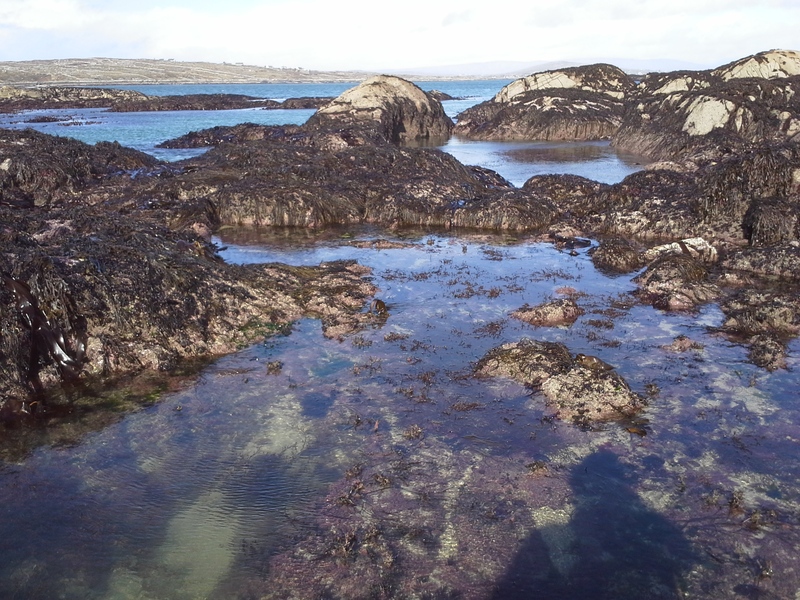 As the tide started to rise again I waded through a fairly deep (1m) pool to get to the otherside of a cliff and green blue reflections in the water made me really happy. A school of small sandeel that came quite close when I didnt move. Beautiful to watch and the colours where just amazing. At this stage I was quite wrecked from all the climbing and excitement but the ocean had lots more offerings in store. The biggest attraction for me was when I saw this furry leggy thing just sitting completely exposed in a small pool of coral sand, when I looked closer it seems to be some kind of a decorator crab. 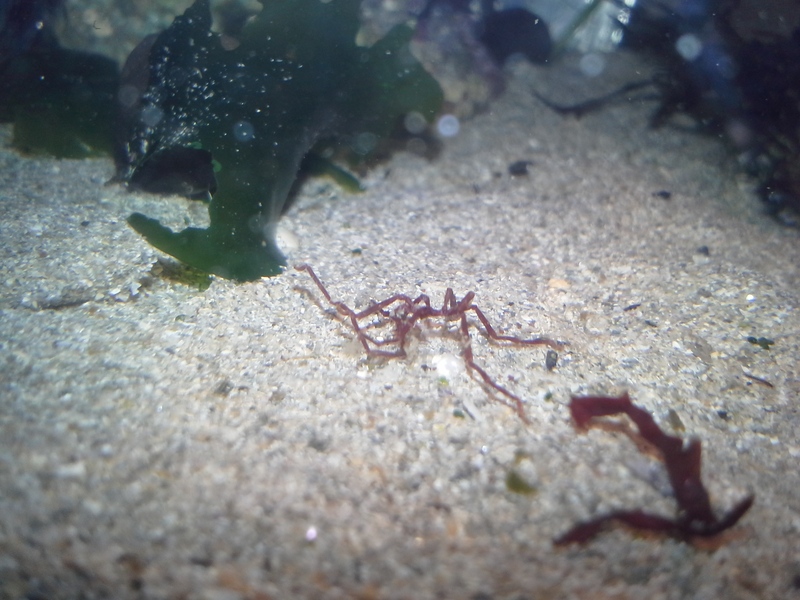 However the ones I see in books and other aquariums usually have a lot longer legs and are more spider like. This one is fairly chunky and compact and seems to like the hairalgea 🙂 Absolutely great to watch as its very adventurous and not the usual hide under rocks crab as I thought. I nearly forgot that I finally found an intact mermaids purse dogfish egg. Many have successfully hatched those in aquariums so I hope it works for me too, would be a great observation.